Good day at Exebowl V today. A day of milestones – my 80th NAF tournament, my 26th NAF race, my 400th NAF game, and my first NAF loss to one of my children! Exebowl is close to my heart because I’m a South-Wester at heart, having been born in Plymouth and gone to school in Somerset, so I’ll always make an effort to attend. 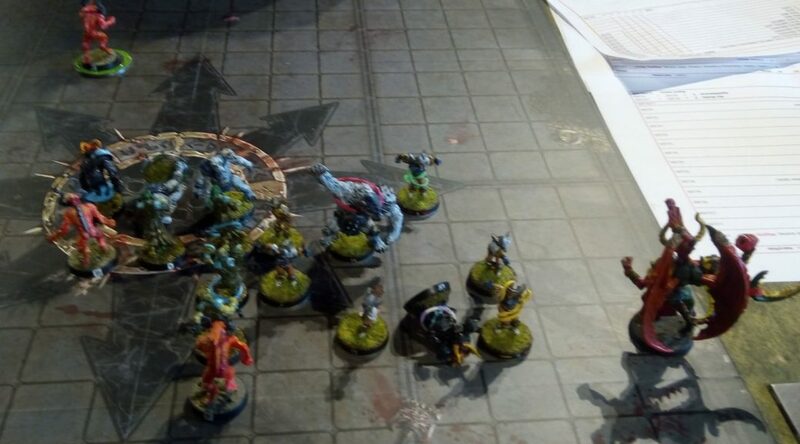 The fifth edition was a bit smaller than usual, after a move to Kirton Games in Crediton (half an hour from Exeter itself) and a change in organiser, but 18 people gathered in the Kirton Games loft. It’s a nice little games shop, with tables perfectly sized for BB and a choice of traditional seats or bar seating (i.e. tables at different heights). My first game was against HairyPete, @amanandhistoys on Twitter, the originator of Exebowl and a thoroughly nice bloke. I scored in 5 turns, giving him 4 back. He was pretty comfortable until he thought that my Bloodthirster had M5 intead of M6, and left the ball carrier exposed as a result. The surf put my chap on the sideline (a juicy “return surf” target) but also one of my players on the ball and heading for the score. Pete had to choose between surfing and stopping the score (see top picture), and went for the surf for entertainment value, so I went in 2-0 up. In his half he managed to remove a few players, and scored in 6 turns, giving me 3 to chill out and protect the lead. This wasn’t to be, alas, as he rolled a blitz, which combined with the scatter to make life difficult. I managed to hold on though for a 2-1 win. Alex and Linus were both in commanding positions, but managed to throw them away for draws. Kids, eh? Game 2 was v Dru Drew, so good they named him twice. Using orcs, which I think are a great match up for Khorne, as the can opener can do its worst. Fairly comfortable 1-0 at the half, but then my drive went pear-shaped because of a 1 in 81 block failure. Very squeaky 2-0 after a punt down the pitch. Alex’s wood elves did the elf thing and won 4-0, and Linus got beaten up as Pete took his revenge on the clan. Three coaches on 2 wins going into game 3, but as I was the lowest I played against the highest on a win and a draw, which happened to be Alex (that 4-0 win!). It was also going to be third game on the stream, which can be found at twitch.tv/kirtongames. I started to beat him up a bit, though this was limited by three consecutive failed wild animal blitzes in the first half and two at the start of the second half. I went in 1-0, though it was far from straightforward. On his drive he scored in 3, but again shenanigans were required, leaving me 6 turns to get the win. Unfortunately, I was still facing 10 elves, despite a plethora of armour breaks. In short, I failed to analyse the wardancer threat effectively, and he made me pay, stripping the ball, recovering it, then stalling out effectively for the win. A good day for the clan overall – Alex in 2nd with most TDs, me in 3rd, Linus on 0/2/1, and Zoe introduced to the glorious world of tournament Blood Bowl!